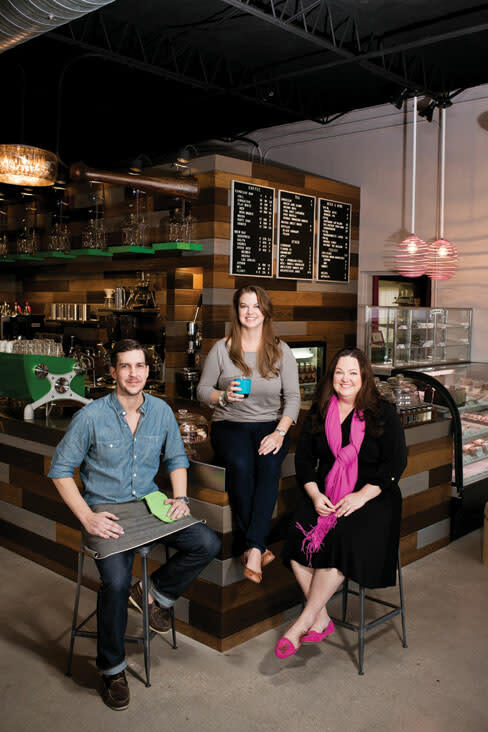 Erin and Keith Zolner and Amy Nichols are bringing craft coffee to Sarasotans via their Perq Coffee Bar. The buzz (pun intended) surrounding the opening of Perq Coffee Bar last May was intense, and it hasn’t subsided. Featuring single-origin coffees sourced through artisan roasters and offering a selection of teas, juices and sweet and savory treats daily, the Hillview Street coffee shop has quickly become a local favorite. The brainchild of husband and wife Keith and Erin Zolner, and Erin’s sister, Amy Nichols—you might recognize Erin and Amy from the popular Lollicake Queen bakery, Perq’s sister business and next-door neighbor—Perq is making Sarasotans rethink coffee, from how they order it to how it’s brewed. And that’s exactly what the Zolners and Nichols were hoping for. All in the family. “Erin’s daughter, Olivia, did the initial branding for the Lollicake Queen,” says Amy, who used those designs as a jumping-off point for Perq’s collateral. Erin and Amy’s mother has worked with them since Day One as well. And Keith “did a lot of the contracting work,” says Erin, adding that the trio jumped on the space—a former spice shop—as soon as it became available. How about that espresso machine? Perq is the only coffee shop in Florida—and one of only three in the South—to use a Slayer espresso machine, hand-built in Seattle and famous among coffee connoisseurs. “It allows us to custom-craft a brew profile for each of our beans and bring out some of the tasting notes and really interesting characteristics,” Keith says. Small Batch, From Scratch: Perq’s house-made treats—which include cookies, scones, mini-cupcakes and more—are all made in small batches, using only organic local fruits and vegetables. Keeping it Local The owners have partnered with Mozzarella Fella to offer a selection of the restaurant’s signature sandwiches. “It’s important for us to support other [local] businesses doing awesome things with food,” says Erin.